Sony DMP-Z1 portable music player hands on review | What Hi-Fi? We take a first look at Sony's high-end "portable" music player. If there was one product that stood out at IFA 2018, it was the Sony DMP-Z1. It's a portable digital music player unlike anything else. For one, it’s certainly not “portable” by any conventional means. It’s huge. It does have a 10-hour battery capacity when not plugged into the mains, but the DMP-Z1 looks more like a desktop-sized DAC or small amplifier than a Walkman-sized player you can put in your pocket. Secondly, it costs a staggering £8000. Part of Sony’s high-end Signature audio series (which also includes the €3300 gold-plated NW-WM1Z Walkman from 2016 and new £2000 IER-Z1R in-ear headphones), the DMP-Z1 uses high quality internal components, comes packing full high-res audio support up to 32-bit384kHz PCM and to quad DSD (11.2MHz). But what really grabs our attention is that gold-plated, analogue, rotary volume control. It’s lovely in use, has next-to-none resistance when turning it smoothly, and the volume increments are just as subtle and smooth. The entire casing is built out of solid aluminium, has a lovely mirror-finished aluminium top plate and spin-finished aluminium playback control keys. There’s also a 3.1-inch touch screen on the top plate, which basically uses the same interface you’ll find in the top-end Walkman. This is a classy looking bit of kit. Inside, you'll find a high-quality headphone amp, dual Asahi Kasei Microdevices AK4497EQ DACs and an analogue amplifier section. Sony's DSD Remastering Engine is included, too, which allows you to convert all PCM music sources to DSD 5.6MHz. The player has an independent battery power system, which uses five separate battery cells to power both the player's digital and analogue blocks. A full charge gets you ten hours of playback of non-high-res tunes (up to 128kbps) and around nine hours of high-res tracks (24bit/96kHz). How much of your hi-res music library can you store on the DMP-Z1? Well, it has 256GB of on-board storage, but you can expand that further thanks to two microSD card slots at the side. A Bluetooth receiver (aptX HD) is also built in, and you can use the USB-C connector to plug it to your laptop. There are balanced and unbalanced headphone inputs, and the DMP-Z1 is powerful enough to drive all kinds of headphones. For its price and calibre, you’d want to invest in a really good pair of headphones to match, too. If you’re determined to carry the DMP-Z1 with you on holiday, you can get a sturdy carry case that keeps the £8k music player strapped in securely. We wouldn’t take it with us on our morning commute, though - it’s heavy. On a more realistic level, its portability seems to make sense if you’ll be moving it around in the house or listening in the garden. 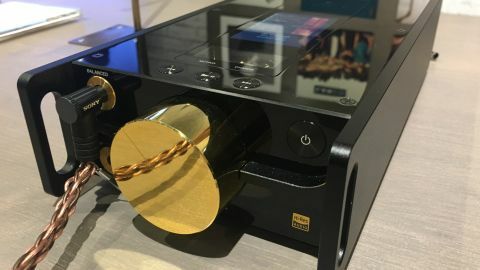 On the demo stand, the DMP-Z1 was loaded with over a dozen 24-bit hi-res albums, and had Sony’s high-end MDR-Z1R over-ears (£1700) plugged into the balanced headphone jack. The big, roomy closed-back headphones do stave off the noise of a busy trade show floor a little bit, but the DMP-Z1’s sound certainly held our attention. With the big disclaimer that it’s always difficult to judge nuances in sound quality at a trade show demo, the Z1 player sounded rather stunning in our brief demo. The presentation was large and airy, seeming to give plenty of space for subtle detail to breathe. It had a velvety, fluid way with songs, and a strong sense of solidity running through the entire frequency range that made every song sound incredibly tangible and articulate. There seemed to be endless weight and depth to the notes, eking out as much texture and nuance possible. We played a variety of songs, all in 24-bit hi-res – I Fall In Love Too Easy by Miles Davies, All Time Low by Nine Inch Nails, Walk This Way by Aerosmith – and and while you can clearly hear the differences in recording quality, the DMP-Z1 didn’t go out of its way to be harshly transparent. It also sounded clean and seemed to have very little distortion as we kept turning the volume up; we reckon you could listen to player really loudly very comfortably. The player also has something called a “Vinyl Processor”, which Sony claims can recreate "the acoustic phenomenon unique to vinyl playback, such as the tone-arm resonance, tiny surface noise and the rich sound from the vibration by acoustic feedback from the speakers to the turntable". We weren’t able to try this out during the demo, but are curious to find out its effects when we get a review sample in eventually. We can’t say we’ve heard or seen a music player of its ilk and price point in recent times (even the £3300 Astell & Kern A&ultima SP1000 is a normal-sized music player), but it certainly makes an impression. It’s a stunning piece of kit with plenty going on. And its performance gave the impression of the kind of quality you’d get with hi-fi separates than other portable music players on the market. The Sony DMP-Z1 is due in UK near the end of the year, and we hope it more than lives up to its gold-plated image and jaw-dropping £8000 price tag when we eventually get it in for a full review.